History: built in 1827, when California was part of Mexico’s territory. The adobe house was built for Presidio Commandat, Jose Maria Estudillo. Very notable San Diego haunting. 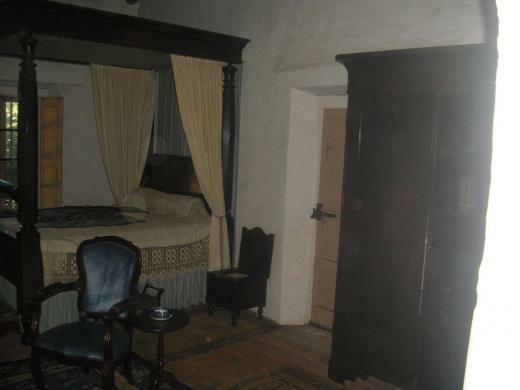 La casa De Estudillo is one of a series of six notable haunted locations including El Campo Cemetery Whaley House, La Casa de Bandini, La Casa de Estudillo, El Fandango Restaurant, and Robinson Rose House. All six suspected haunted locations, share Ley lines with El Campo Cemetary, geographical, and structural commonality. Chapel – A hooded figure, possibly a monk, is witnessed hovering in and out of doorway in priest’s bedroom. Parlor – Twin heavy wooden doors slam closed without reason. Dinning room – a possible figure of a person dressed in vaquero outfit has been witnessed. Bedrooms various – A little girl dressed in Victorian garb, has been seen rocking in a rocking chair. A vaporous male torso seen afloat near sofa. A male wearing period style white shirt seen against back wall. A male torso without legs is seen peering out a window. Various locations – Cold spots, Female voices / screams. Yellowish light of unknown origin, windows and doors opening and closing. Recently Ghost adventures visited this house.